Lately my attitude has been bad. For the first 10 months that I was on this Journey towards better health, I was putting up some incredible numbers. In that time I went from 345 pounds to 237 pounds. I lost over 100 pounds in a very short time. Since then my progress has slowed. Intellectually I knew it would happen, it happens to anyone who is on a long-term weight loss path such as mine. But, for some reason I must have thought I was somehow better than the millions of people who have gone before me. I had this attitude that it wouldn’t happen to me. I have been going around telling anyone who will listen that I have been on a plateau. 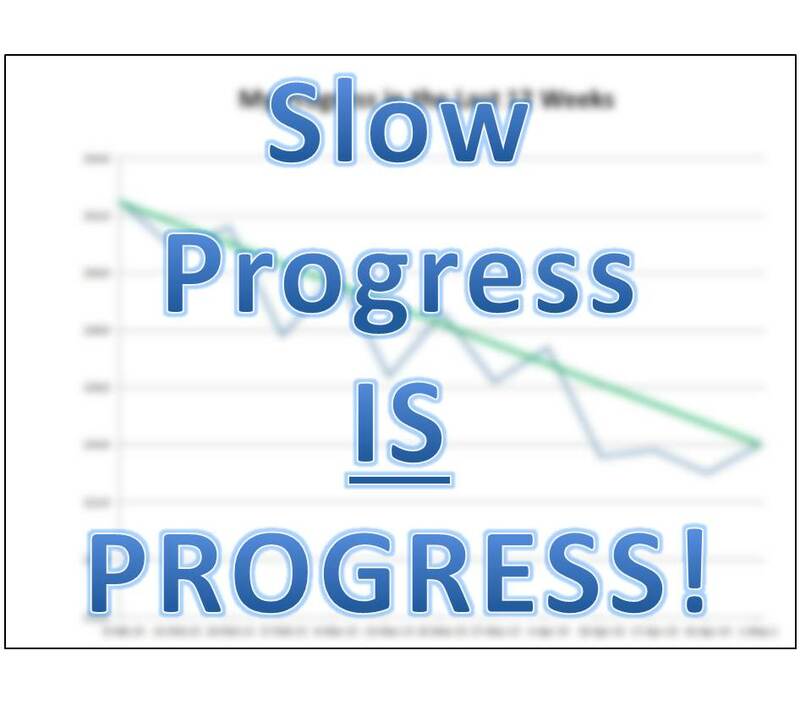 I convinced myself of this because my progress had slowed. What I was ignoring was that I was, indeed, losing weight. On February 13 I weighed-in at 232.4 pounds. Today I tipped the scale at 224.0. That is a 7.6 pound loss. Is it the rock-star pace I was on for 2014? No, but it was unrealistic to believe that pace would continue. But let’s get some perspective here. Since crossing the 100 pound loss mark, I have lost another 21 pounds. Since January 1, I have lost 18.8 pounds. Since starting my new job assignment on November 1, I have lost 27.4 pounds. 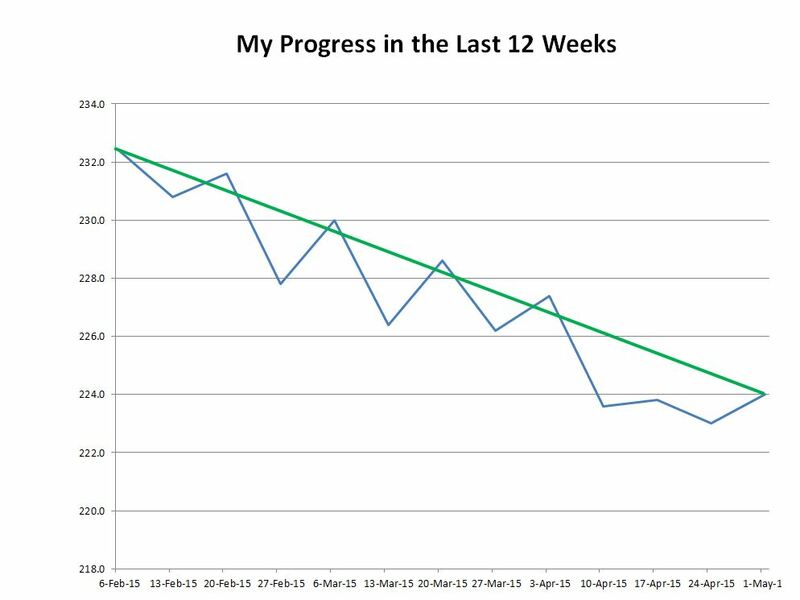 In the chart above I put in the green line to remind me that I am, indeed, losing weight. When it is viewed from the perspective of my long-term loss, it looks less dramatic, but why I am doing that to myself? After all…. Do you know how many people I have said that to? Do you know how many people I have encouraged who have lost LESS weight than I have in recent weeks? Yeah, a lot. But for some reason that message wasn’t getting through my somewhat less thick skull. Today is May 1! I am glad to see April in the rear view mirror. Traditionally May is a difficult month for me emotionally, but I am bucking that tradition this year. I am waking this morning with a freshened attitude. For the week I weighed-in at 224.0 pounds. That is a 1.0 pound increase from last week, and my total loss is now at 121.0 pounds, or 35.1% of my original weight. Starting today I am taking up the challenge to walk 100 miles in the month of May. I posted this on a Facebook group I belong to that has 12,000 members, and the response there has been overwhelming. Some people have even contacted me here about taking up the challenge. It’s simple, for the month of May, try to move yourself 100 miles. If you are a walker like me, then walk. If you are a runner or jogger, do that. The idea is to stretch ourselves to do a little bit more. I have taken up challenges like this in the past, and have had great success. I’ll be posting my progress here for the world to see. This morning the month was kicked off with a 4.0 mile walk on the treadmill. I am making the decision to have a better attitude. The one I had in April wasn’t serving me well. It was making me doubt my progress, doubt my plan, and sulk when there were minor corrections on the scale. Today I am letting go of that frustration, and looking forward to a May full of fun, progress, diligence and hard work. ← How about a challenge to spark things up? OMG I feel like we had similar Aprils. Yes May will be better. Thanks for the May challenge. I am in!